Thursday was another lazy day at sea. 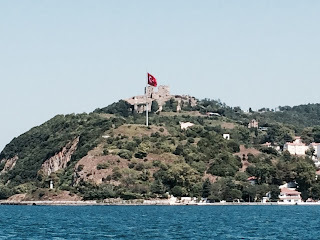 In the afternoon we passed through the Dardanelles and by the Gallipoli Peninsula. 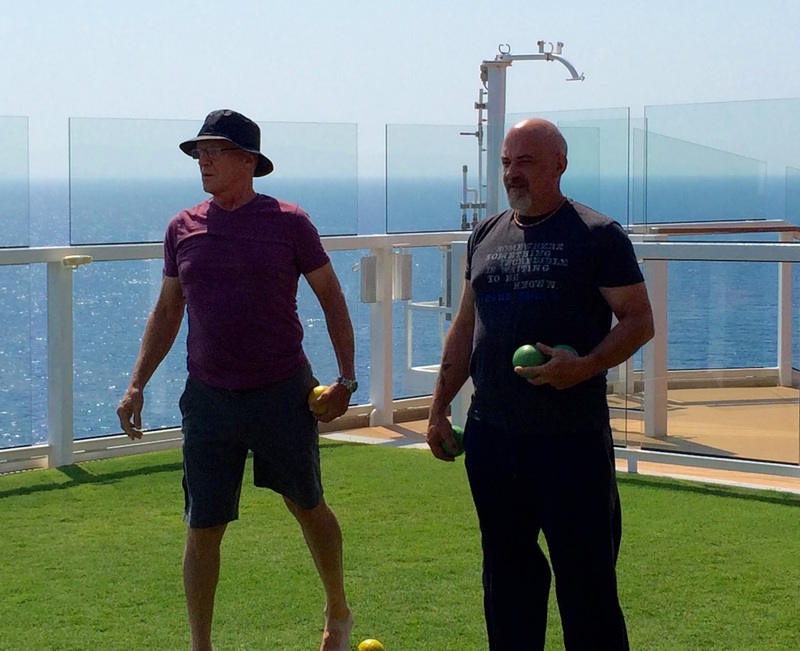 I got a picture of Dan and Dirk playing bocce on the lawn on the top deck of the ship. Friday morning we woke up to the arrival at Istanbul. Dan and I were here 15 years ago and had wonderful memories of a ferry trip up the Bosporus. So right after breakfast we all headed out to the ferry port, about a half-hour walk from our ship. 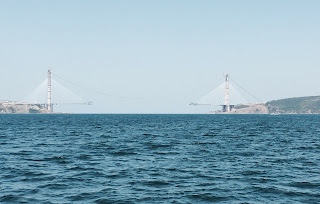 The ferry terminal is right where the Golden Horn meets the Bosporus, across the Galata Bridge. It was a very hot walk, but we made it without incident. The ferry left at 10:35 and headed north, stopping at four or five towns, alternating between the European and Asian sides. At the last stop, the ferry stays for nearly three hours and the passengers fan out to have lunch, shop, or hike up to the fortress overlooking the Black Sea. 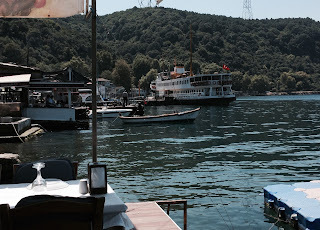 We found a restaurant right on the water (we could look straight down from our table and see the fish swimming in the clear water). After we ate (fish, of course), Dan, Dirk and Tracy hiked up to the fortress. Several of us dozed on the return journey. I was quite tired and it was very hot so I decided I would not walk back to the ship, as we still had a special event that night. So Dan and I got a taxi. Unfortunately, the traffic was terrible (as is usual here, I’ve heard) and he had to take a very long way round (so he said…). We got back after the others, paid way too much, and still had to walk the last quarter mile or so! This was our anniversary day and Anjali had made reservations at a special restaurant that featured food of the Ottoman Empire. After our taxi ride, we all began to have doubts that we would be able to get there; it was quite a distance away from the ship. But we got dressed up and went down to the taxi stand to see what was possible. There were no taxis who could take six passengers and the estimated cost put the price way out of our range. We all reluctantly agreed that we should stay on the ship for dinner after all. We had a pleasant celebration after all. The dinner was ended with a small chocolate cake saying “Happy Anniversary” and the three waiters singing to us. The cake was delivered to our room a bit later. 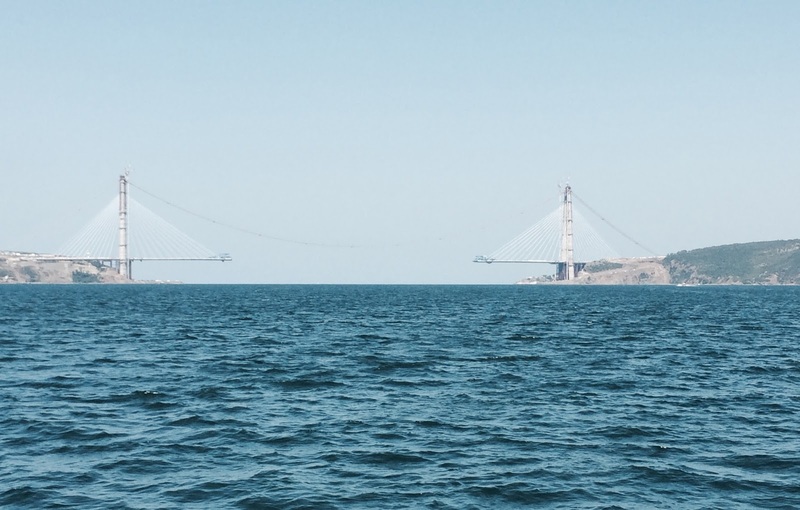 Today (Saturday) we are in Istanbul until 1:00, when we head for Kusadasi (Ephesus) for tomorrow. P.S. I had a chance to see a map and realized that what I identified as Palermo, Sicily, was actually Messina. Palermo is on the northern side of the island. I have corrected it! Nice clear weather for outdoor pics! Enjoy!